We brought Rocky home in May 2010. 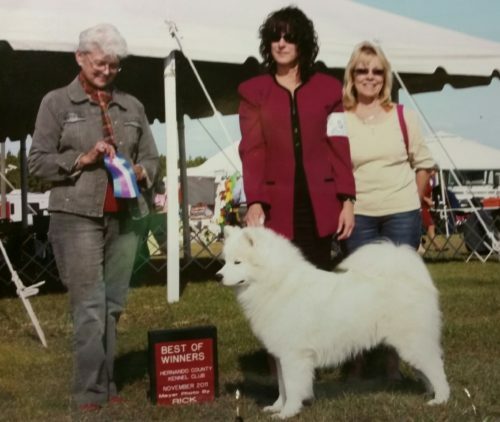 He was the first Samoyed I excitedly showed in the ring. The excitement was not shared by Rocky. He tried the show ring and won Best of Winners in Brooksville, FL but he never liked it. Rocky is a very loving dog with a great temperament. He prefers running and playing in the yard. We lost Rocky on August 26, 2017 when he crossed over the Rainbow Bridge. My heart is broken and he is missed very much. He was our “Rock Star”!